Motorcyclists get to ride with the wind in their hair and the sun on their face. Despite this freedom, motorcyclists face a lot of dangers. They are much more likely to die in a crash than an occupant of a passenger vehicle. They also have to deal with dangers that do not affect other vehicles, such as potholes, debris on the road, puddles, wind and visibility issues. Left-hand turns are other issues that motorcyclists frequently face. Motorcycles are smaller and less visible than other vehicles, which means that a collision with a larger vehicle can have fatal consequences. This was an issue that a Florida man recently faced. The 47-year-old man from Holiday was recently killed in a crash after an SUV turned left in front of him. The fatal accident happened on the morning of January 31 at the intersection of U.S. 19 and Denton Avenue in Hudson, located in Pasco County. The man, who was wearing a helmet, died at the accident scene. Nobody else was injured in the crash. The accident occurred when a 48-year-old woman from Spring Hill, who was traveling south on U.S. 19 in a Hyundai Tucson, made a left turn at the intersection against a flashing yellow light. She turned in front of a Suzuki motorcycle driven by the man and the two vehicles collided. The motorcyclist had a green light at the time. Left turn accidents are among the most common types of motorcycle crashes. In these accidents, one vehicle is traveling straight, while another moves across one or more lanes of traffic. The vehicle traveling straight can get hit in the front, middle or back. When it gets hit in the front or back, the injuries are typically less severe. When the vehicle is hit in the middle, the occupants of the vehicle are at the highest risk of injury. In fact, fatality is likely in this case. This is especially true for motorcycles, where the impact is more severe and the motorcyclist has less protection. Those who are making left turns can prevent accidents by taking a few extra steps. The driver should come to a complete stop before attempting the turn. The driver should also pay attention, looking in all directions before turning. Patience is also key. It is important to wait for an opening. Do not assume that the vehicle in the other direction will slow down and stop so you can make the turn. Be aware of curves and bus stops and be prepared to wait your turn. Avoid risky situations. While fun to drive, motorcycles are not safe vehicles. They lack protection, unlike cars. 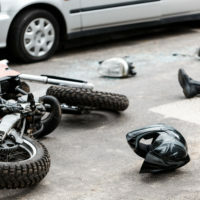 A motorcycle accident can lead to serious injuries and even death. If you or a loved one has been involved in a motorcycle accident, the Dade City personal injury attorneys at Mander Law Group can help you obtain compensation for medical bills, funeral expenses, property damage and other expenses. Call our office at (800) 557-0411 to schedule a consultation.